Experience the unbridled energy and unique charm of The Big Easy when you stay at New Orleans Downtown Marriott at the Convention Center. Housed in a renovated 19th century cotton mill and bordering the Warehouse/Arts District, the CBD, the Garden District and the French Quarter, our four-star hotel successfully blends historic elegance with modern style. Intuitively designed rooms offer deluxe bedding, flat-screen TVs and views of the river or city. Featured amenities include a gym, an outdoor pool, 24-hour room service and Wolfe's, our popular restaurant featuring Creole and French favorites. Our hotel is a prime destination for business travelers, thanks to our flexible event venues and our proximity to the New Orleans Ernest Morial Convention Center, across the street. With so many New Orleans attractions and the Arts/ Warehouse District at your fingertips, you'll never be short of things to do while you're here. Make plans for a remarkable stay at New Orleans Downtown Marriott at the Convention Center. Wolfe's: Get ready for a busy day in New Orleans with an energizing breakfast at our Warehouse District restaurant. Sample our contemporary Creole and French fare for lunch or dinner, or enjoy evening cocktails at our elegant wine bar. Wolfe's Bar: Classic American and New Orleans food and beverages. 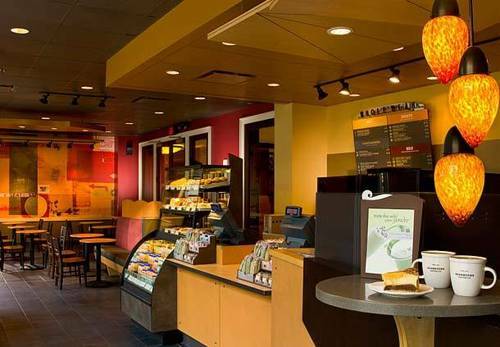 Starbucks : Stop by for your favorite coffee drink and treats as you head out for sightseeing or to events at the convention center near our downtown hotel. Grab a pick-me-up in the afternoon to recharge for an evening of fun in New Orleans. Freeport- McMoRan Copper & Gold Inc.